Celebrate International Dot Day with these creative activities! 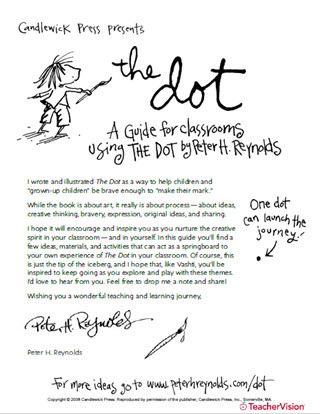 International Dot Day, based on best-selling author Peter Reynolds's children's book The Dot, is "September 15-ish" every year. Incorporate these activities into your own Dot Day celebration! Encourage children's creativity and delight their imagination with the art activities and extension ideas in this classroom activities guide for The Dot. Students can create their own dot and frame their artwork with these printable resources.